On the 20th anniversary of Stephen Wilkes documentary project photographing the abandoned buildings on the southern side of Ellis Island, and with the future of immigration and refuge in America in contention, Wilkes takes us on an unforgettable journey through our collective past that reminds us how we became the diverse nation that we are today and asks us to reflect on our own humanity. 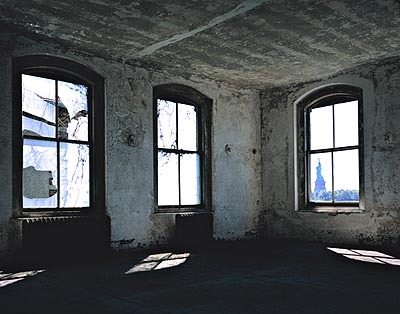 Monroe Gallery of Photography, 112 Don Gaspar, is pleased to present “Ellis Island: Ghosts of Our Ancestors”, a timely exhibition which opens with a public reception for the photographer on Friday, October 5, from 5 – 7 PM. The exhibition continues through November 18. Twelve million people passed through Ellis Island from 1892 until its closing in 1954, and tens of millions of Americans today are descendants of immigrants who were thought deplorable by those already here. Wilkes's powerful images of the underbelly of the island—a purgatory between freedom and captivity—ask us to reflect on the defining experiences of millions. Photographed over five years beginning in 1998, the photographs are a visual history of the immigration center and adjoining hospital which grew to 22 medical buildings spread across three islands. In the era before antibiotics, tens of thousands of immigrant patients were healed from illness before becoming citizens. Neglected for almost fifty years, the buildings were in a state of extreme disrepair: lead paint peeled from the ceilings and walls, vines and trees grew through the floorboards, detritus and debris littered the hallways. In rooms long-abandoned, Wilkes captured a spirited new vision of this gateway to freedom. “I photographed every corner, every crevice, in every light. Strange things happened. I’d photograph a mirror attached to a wall for half a century, only to return and find the mirror shattered. I’d photograph a shoe, only to come back and find it disappeared. I photographed the 500-foot long spine of the hospital, Corridor #9, a long tunnel of decay. In the photograph of it, you’ll see a golden glow of sunshine warming the walls at the far end. In all the times I went back, I’ve never seen this glow again, nor can I figure out its origin.